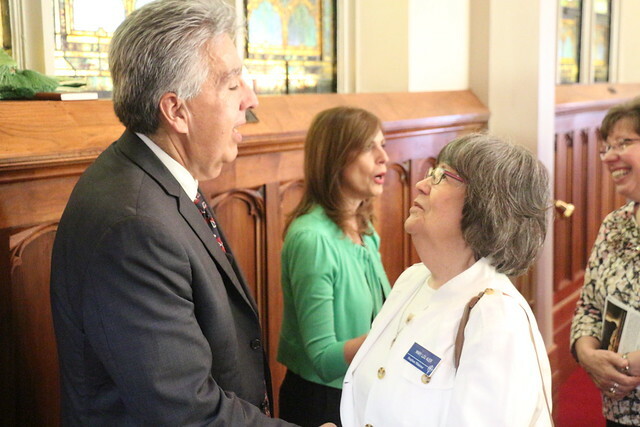 The first weekend in the Great Plains Conference proved earth-shaking for Bishop Ruben Saenz Jr.
Saturday morning, he told the congregation Sunday at First United Methodist Church in Topeka, he had his earphones in listening to music, and his coffee cup started to shake. “My Native American flute music is a little too far off the charts,” Saenz recalled. It turned out to be an earthquake near Pawnee, Oklahoma, measuring 5.6 on the Richter scale, whose tremors could be felt throughout the Great Plains. Saenz continued a long-standing tradition that Topeka First started in the former Kansas East Conference, the Rev. Jeff Clinger said – hosting the new bishop for his first sermon. Saenz delivered the sermon at three Sunday-morning services at Topeka First, two in the chapel and one in the sanctuary. And with Topeka District Superintendent, the Rev. Kay Scarbrough, he also served communion. Clinger said the congregation was impressed with the new bishop, who started Sept. 1 after ministry in the Rio Texas Conference. Saenz spoke on discipleship and how, like a former church of his in Texas, Topeka First is a downtown church. Church member Andrea Clifton said she felt encouraged by Saenz’s sermon. “I think he’s going to be great as far as helping our district feel like a community. He’s already started that feeling of community in our church. He’s helping us. He’s encouraging us, being a downtown church, to engage the community – which we’ve been trying to do,” Clifton said. Mary Lou Auer, a Stephen Ministry leader at Topeka First, said she was impressed by Saenz’s warmth and loving nature.